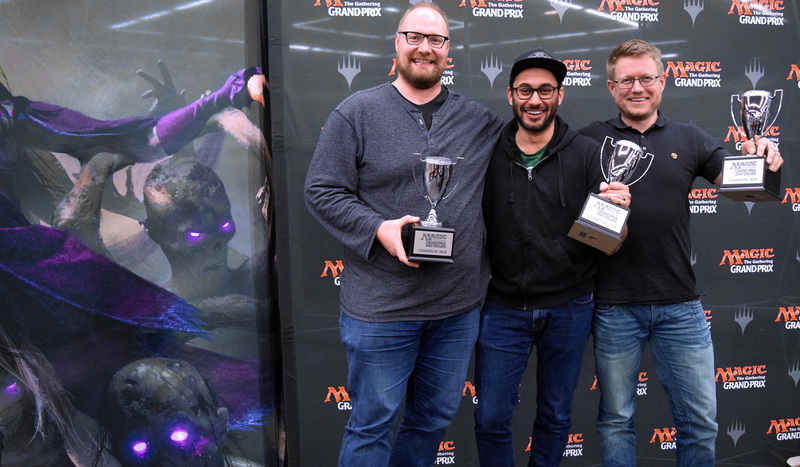 Defeating Geoffrey Siron, Vincent Lemoine, and Davy Loeb in the finals, Jeroen Kreijne, Simon Geurts, and Pim Heijne became champions of the last Grand Prix to feature Ixalan Block in Limited! The hashtag for Grand Prix Amsterdam is #GPAmsterdam. Join the conversation. From Amersfoort to Amsterdam, from Game Day champions to Grand Prix champions! Such was the heroes' journey that we got to witness at the final GP to feature Ixalan Block in Limited. At the beginning of the weekend, no one would have picked the Amersfoort-based team of Jeroen Kreijne, Simon Geurts, and Pim Heijne as likely winners. The field of 522 teams was stacked, with no less than eleven Pro Tour winners and at least 44 returning Grand Prix champions in attendance. However, the local team was the first to lock up a Top 4 berth, incidentally by beating Pro Tour champion Ivan Floch's team in Round 13. And the trio kept at it until the very end. In the finals, they were up against PT champ Geoffrey Siron's team, and once again they prevailed. Congratulations to Jeroen Kreijne, Simon Geurts, and Pim Heijne, champions of Grand Prix Amsterdam 2018! On this beautiful Easter weekend, 522 teams of three players each gathered in the Netherlands' Amsterdam for the final Grand Prix to feature Rivals of Ixalan/Ixalan in Limited. And what better way could there be to celebrate the sets which gave us such iconic battles as Pirates versus Dinosaurs than Team Limited! After the first day's eight rounds of Sealed Deck play, only two teams remained with an undefeated record still intact: Pro Tour champion Ivan Floch, Pro Tour quarterfinalist Thomas Hendriks, and Hall of Famer Frank Karsten as well as Manu Dewulf, Bram Meulders, and 2016 World Magic Cup finalist Jérôme Bastogne. They would have a head start over the competition on Sunday, but said competition included some fearsome opponents such as De Diego/Sifuentes/Calcano, Klocker/Linden/Gerschenson, Siron/Lemoine/Loeb, Pritsch/Schraut/Thiele, Huschenbeth/Severin/Grimmer, and D'Aniello/Moure/Moscato all at 7-1. It was definitely going to be an exciting race to the top tomorrow. Check back then for six more rounds of Team Sealed, for the Top 4 Team Booster Draft playoffs, and for the epic conclusion of Grand Prix Amsterdam 2018!